To see our prices for all the references on our website and get regular vehicle list updates by e-mail, please register by completing the form below. My access to mcautomobiles.com website. By completing this form you agree to receive information and promotional offers from www.mcautomobiles.com. In all cases, if you do not or no longer wish to receive information from www.mcautomobiles.com, simply notify us: by post to the following address : MC Automobiles, Route de touffreville, ZA Saint Léonard - BP20, 76910 Criel-sur-Mer. 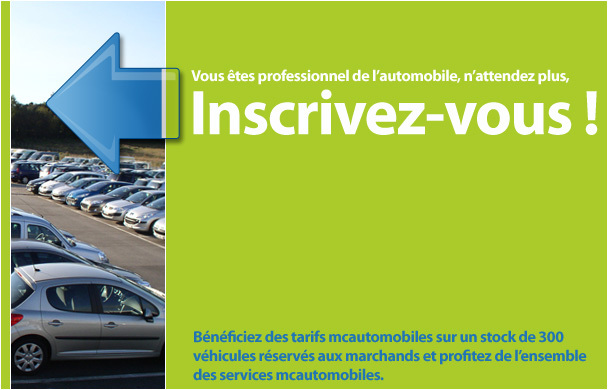 By e-mail to : marketing@mcautomobiles.com or by unchecking the box designed for this purpose on page : My account. The My account page contains any information we have collected about you and is freely editable as soon as your registration is confirmed. Please notice that the information and e-mail addresses collected through mcautomobiles.com registration page will neither be sold nor transferred. According to "Law No. 2004-801 dated 6 August 2004, about protecting individuals with regard to the processing of personal data, which amends Law No. 78-17 dated 6 January 1978 relating to data , files and liberties ", you have a right to access, modify, rectify and delete personal data about you. To do this, simply make the request.